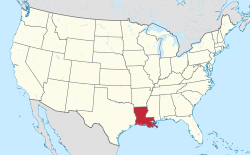 Morgan City is a city in St. Mary Parish in the U.S. State of Louisiana. The population was 12,404 at the 2010 census. Location of Morgan City in St. Mary and St. Martin Parishes, Louisiana. Morgan City sits on the banks of the Atchafalaya River. The town was originally named "Tiger Island" by surveyors appointed by U.S. Secretary of War John Calhoun, because of a particular type of wild cat seen in the area. It was later changed for a time to "Brashear City," named after Walter Brashear, a prominent Kentucky physician who had purchased large tracts of land and acquired numerous sugar mills in the area. It was incorporated in 1860. During the American Civil War, the Star Fort of Fort Brashear was the larger of two works erected by the Union Army occupying the city to defend a Federal military depot and the town. During the Bayou Teche Campaign, on the night of June 22, 1863, 325 Confederates of Gen. A. A. Mouton's command, led by Major Sherod Hunter, landed their skiffs and flats in the rear of the town. Attacking the next day, they surprised and captured the city, taking 1,300 Union prisoners, 11 heavy siege guns, 2,500 stands of rifles, immense quantities of quartermaster, commissary and ordnance stores. They also captured 2,000 African Americans, between 200 and 300 wagons and tents, all while suffering losses of only 3 killed, 18 wounded. In 1876, the community's name was changed to Morgan City in tribute to Charles Morgan, a rail and steamship magnate who first dredged the Atchafalaya Bay Ship Channel to accommodate ocean-going vessels. On October 28, 1985, Hurricane Juan (not to be confused with the 2003 storm of the same name) made landfall near Morgan City, flooding many parts of the city. The storm then looped offshore and came onshore again in Alabama. On August 26, 1992, Hurricane Andrew came ashore 20 miles (32 km) to the southwest of Morgan City. Andrew was the second most destructive hurricane in U.S. history, crossing Florida and then regaining strength in the Gulf of Mexico before it struck Louisiana. A type of blackberry deemed the Youngberry was developed by B.M. Young in 1905 in Morgan City, as a hybrid between a variety of blackberries. The Youngberry is a cross between Luther Burbank’s, Phenomenal Berry, and the Austin-Mayes Dewberry, a trailing blackberry. The Youngberry was introduced commercially in 1926 and quickly came to rival Loganberries. The Youngberry had excellent qualities, such as taste and high yields and it soon replaced the Loganberry of California. According to the United States Census Bureau, the city has a total area of 6.2 square miles (16.1 km2), of which 6.0 square miles (15.5 km2) is land and 0.27 square miles (0.7 km2), or 4.03%, is water. If the Mississippi River were to experience a major course change in the vicinity of the Old River Control Structure or Morganza Spillway, the main channel of the river would likely enter the Gulf of Mexico near Morgan City instead of New Orleans. As of the census of 2000, there were 12,703 people, 5,037 households, and 3,394 families residing in the city. The population density was 2,166.5 people per square mile (837.0/km²). There were 5,627 housing units at an average density of 959.7 per square mile (370.8/km²). The racial makeup of the city was 71.28% White, 23.90% African American, 0.91% American Indian (U.S. Census), 1.02% Asian, 0.01% Pacific Islander, 1.18% from other races, and 1.69% from two or more races. Hispanic of any race were 3.37% of the population. There were 5,037 households out of which 31.2% had children under the age of 18 living with them, 47.0% were married couples living together, 15.8% had a female householder with no husband present, and 32.6% were non-families. 28.0% of all households were made up of individuals and 10.8% had someone living alone who was 65 years of age or older. The average household size was 2.48 and the average family size was 3.04. In the city, the population was spread out with 26.4% under the age of 18, 8.7% from 18 to 24, 27.7% from 25 to 44, 23.3% from 45 to 64, and 13.9% who were 65 years of age or older. The median age was 36 years. For every 100 females, there were 93.0 males. For every 100 females age 18 and over, there were 91.8 males. The median income for a household in the city was $28,324, and the median income for a family was $36,196. Males had a median income of $31,712 versus $19,550 for females. The per capita income for the city was $14,577. About 17.7% of families and 20.7% of the population were below the poverty line, including 27.3% of those under age 18 and 17.7% of those age 65 or over. There is a Catholic school, Central Catholic High School. ^ "Morgan City, Louisiana". quickfacts.census.gov. Archived from the original on December 4, 2012. Retrieved November 26, 2012. ^ L. Boyd Finch, "Surprise at Brashear City: Sherod Hunter’s Sugar Cooler Cavalry," Louisiana History, Fall 1984, pp. 403-435. ^ Louisiana Department of Culture, Recreation and Tourism. "Morgan City Historical Marker". ^ "Geographic Identifiers: 2010 Demographic Profile Data (G001): Morgan City city, Louisiana". U.S. Census Bureau, American Factfinder. Retrieved March 29, 2013. ^ "Will the Mississippi River change its course in 2011 to the red line?". Mappingsupport. Retrieved 2011-05-08. ^ "Mississippi Rising: Apocalypse Now? (April 28, 2011)". Daily Impact. Retrieved 10 May 2011. ^ United States Census Bureau. "Census of Population and Housing". Retrieved October 23, 2013. ^ "Annual Estimates of the Resident Population: April 1, 2010 to July 1, 2013". Retrieved August 27, 2014. Wikimedia Commons has media related to Morgan City, Louisiana.